On June 10, 1861, Henry Lawson Wyatt lost his life at the Battle of Bethel in Virginia. It was the first battle of the Civil War and Wyatt was among the first casualties. A member of the Edgecombe Guards, part of the 1st North Carolina Infantry, Wyatt was mortally wounded as he dashed across an open field with four others. A volley ripped through the squad and all hit the ground. Wyatt was shot, and seen to have “a clot of blood on his forehead as large as a man’s fist.” His fellow soldiers found him still breathing and carried him to a hospital in Yorktown. He weakened through the evening and, the following morning, the 19-year-old carpenter died. Wyatt’s compatriots escorted his body to a boat that carried him up the York River. From there, his remains travelled by rail to Richmond. He was interred at Hollywood Cemetery there, the first of 18,000 Confederate burials. 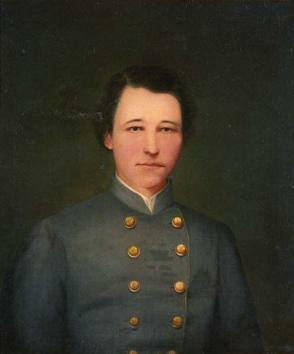 As early as 1866, Wyatt was hailed as the Confederacy’s first war casualty. Others pointed to earlier deaths in smaller actions, setting a stage for a debate that rages to this day. Wyatt defenders have countered by recognizing him as the first casualty in a line of battle.